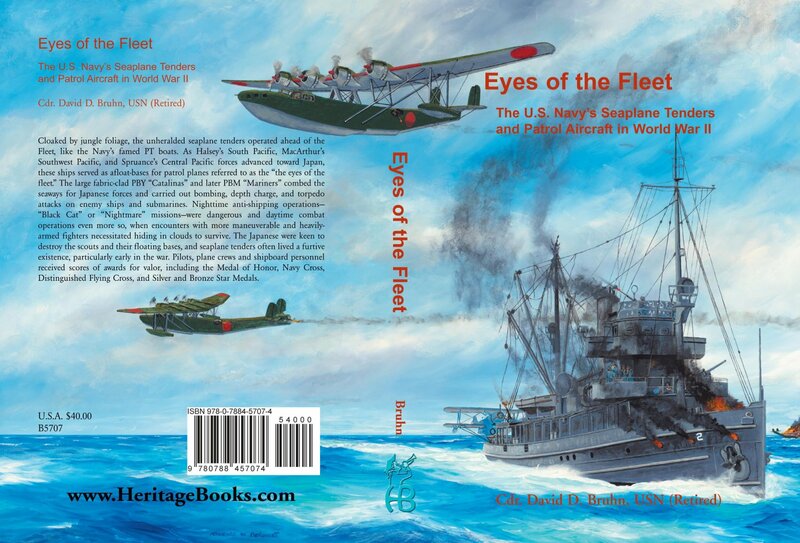 Eyes of the Fleet: The U.S. Navy's Seaplane Tenders and Patrol Aircraft in World War II - David Bruhn. Cloaked by jungle foliage, the unheralded seaplane tenders operated ahead of the Fleet, like the Navy’s famed PT boats. As Halsey’s South Pacific, MacArthur’s Southwest Pacific, and Spruance’s Central Pacific forces advanced toward Japan, these ships served as afloat-bases for patrol planes referred to as the “eyes of the fleet.” The large fabric-clad PBY “Catalinas” and later PBM “Mariners” combed the seaways for Japanese forces and carried out bombing, depth charge, and torpedo attacks on enemy ships and submarines. Nighttime anti-shipping operations—“Black Cat” or “Nightmare” missions—were dangerous and daytime combat operations even more so, when encounters with more maneuverable and heavily-armed fighters necessitated hiding in clouds to survive. The Japanese were keen to destroy the scouts and their floating bases, and seaplane tenders often lived a furtive existence, particularly early in the war. Pilots, plane crews and shipboard personnel received scores of awards for valor, including the Medal of Honor, Navy Cross, Distinguished Flying Cross, and Silver and Bronze Star Medals. 2016, 6x9, paper, index, 546 pp. 101-B5707 ISBN: 0788457071 The book can be Previewed and purchased on the Internet from Heritage Books Inc.